I am so excited to be participating in Red Ted Art's new series called Kids Get Arty: Exploring the Great Artists. The goal is to explore different artists with your kids and create together! 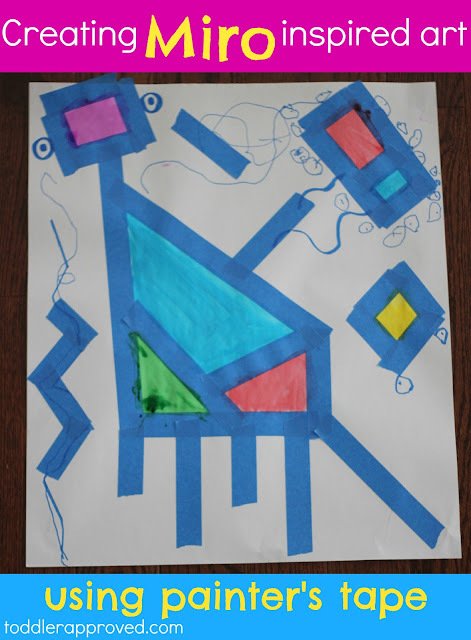 This month we decided to learn about Joan Miro. When I was in college I did a study abroad and spent several months in Spain. I loved seeing the variety of art across the country and visited tons of museums. We spent hours at different art museums each week. Although I can't remember which museums had Miro exhibits, I know I saw several of his works. Joan Miro's art always makes me happy because of the vibrant colors. I didn't spend that much time talking with my son about Joan Miro's life, but we did look at some of his paintings and we talked about the lines and shapes that you can find in them. We adapted this great Miro art lesson for 1st graders from Deep Space Sparkle (a favorite art instruction website of mine) and tweaked the materials and had a great time exploring! Do you want to make Miro inspired art using painter's tape too? 1. Talk about the difference between lines and shapes. We talked about lots of different types of lines- squiggly, curvy, zig zag, diagonal, etc. 2. Use your painters tape to create lines. 3. Talk about shapes and how lines connect together to make shapes. 4. Use your painters tape to create shapes. 5. Once your shape and line pictures are done, use paint to fill in the shapes. 6. Optional- we also used markers to draw some extra shapes and lines that we couldn't make with painter's tape- like circles (to make eyeballs) and curvy lines. Another great part about art is that it sometimes tells a story. One of my favorite parts about studying different art pieces is learning all about the story behind the piece or what story the artist was trying to tell. I told my son about how art sometimes tells stories... so once he was done creating, he wanted to write a story about his art piece. He started off by writing his name, moved into writing about how the object he created was a giraffe, and then transitioned into writing a whole story about a tornado and a volcano! His artwork is very busy and full of ideas! It was fun to see his little mind working. Older toddlers/young preschoolers could probably stick the tape on all by themselves, but for younger toddlers, adults can stick tape shapes and lines onto the paper and just have them paint in the shapes and draw their own lines/shapes with markers. Don't expect toddlers to color in the lines or even stay within the shape. As they draw you can talk with them about what they are drawing and seeing and you can also model next to them on your own paper how to draw a straight line or a curvy one. Mostly though, just let them explore, talk together, and have fun! What would your child create with painter's tape? Do you or your child ever like to write stories about your art? Who is your favorite artist? If you want to discover many many more posts inspired by other great artists, head over to Red Ted Art and check out almost 50 art inspired blog posts. I am already trying to decide which artist we will study next for July's "Kid's Get Arty" post. Are you participating in "Kid's Get Arty? What artist would you pick to study? Great idea to use the painters tape - makes it much more managable for small hands. Love how he added little details. Thank you for joining Kids Get Arty! This is such a fun idea! I will need to try painters tape with my guy.